Ahram Online ends its live coverage of the day's deadly confrontations between IS militants and the Egyptian army in northern Sinai. 23:00 Eyewitnesses tell Ahram Arabic news website that Egyptian army Apache helicopter airstrikes continue to target Islamist militants' hideouts in Sheikh Zuweid city.The witnesses also report power outage in the city. 22:15 Egyptian army spokesperson Brigadier General Mohamed Samir posts dozens of pictures on his official Facebook page of dead individuals the army says it killed on Wednesday as it fended off a major attack by IS militants in Northern Sinai. 20:45 Major General Talaat Moussa, former head of Egypt’s military intelligence, told Ahram Online that "some Bedouins support hundreds of domestic and foreign Islamist militants that execute armed operations against government forces in North Sinai." “They [militants] have been present in Northern Sinai for a while, they didn’t all come out of the blue. Why didn’t the Bedouins report this issue to the government? There is definitely a common interest between both sides”, he said. 20:10 The General Command of the Armed Forces has issued its first official statement on Wednesday’s battles against Islamist militants who attacked army posts earlier in the day. The statement said that the army killed more than 100 militants during its counter-attacks in Sheikh Zuweid and Rafah cities. It also highlighted that 17 army personnel including four officers were killed during the fighting and 13 others were injured. The army also said that it has destroyed 20 vehicles used by the Islamist militants to launch their attack. 19:20 Major General Hisham El-Halaby who teaches at the National Defence college of the Nasser Military academy- told Ahram Online that the initial number of militants who attacked the army in North Sinai earlier in the day was around 70. "Those 70 who attacked the forces in Sheikh Zuweid represented the first wave of attackers. The total number of attackers throughout the day might exceed 300 elements or even more. This is a new technique that the militants have been using in their operations ," El-Halaby explained. However, El-Halaby says that there were gaps in the military’s preparedness, which were capitalised on by the militants who receive instructions from foreign intelligence agencies. 18:40 Ahram Online learned that the National Defence Council is set to hold an emergency meeting in the coming few hours to assess current political and military developments in the aftermath of both the assasination of the prosecutor general on Monday and IS assaults on army positions in Sinai today. The Council, which assists the president in formulating national security policy, is headed by El-Sisi and includes top military and public officials. 18:00 Sources tell Ahram Online that at least 64 Egyptian army soldiers and civilians are confirmed dead, but a number of serious injuries might push the total figure of fatalities above 70. 17:38 Counter-attacks by the Egyptian military against the IS group in North Sinai have left 90 militants dead, Sky News Arabia reported in late Wednesday afternoon. A security source told Sky news Al-Arabiya that 50 of those reportedly dead militants were killed following an airstrike that hit their sites in North Sinai. Sky News also reported that more than 60 Egyptian soldiers and civilians have been killed since the start of the IS group attack against the army in the morning. 16:55 Reports from Sinai indicate that the atmosphere on the ground has cooled down as the army starts to regain control over the city of Sheikh Zuweid. The siege of the Shiekh Zuwaid police station by IS armed men was broken and the army’s air strikes left dozens of IS militants dead, according to sources in the city. A military source confirmed to Al-Ahram Arabic news website that ongoing raids by the army against IS militants will continue throughout the rest of the day. The source also said that the military is using Apache helicopters to bomb terrorists sites. The source also added that an emergency meeting of the entire military leadership has been in session at the central command room in Cairo to monitor the military operations in north Sinai against the militants. 16:15 Romain Nadal, spokesperson for the French Ministry of Foreign Affairs, expresses his condolences to the families of the Sinai attack victims, says France will stand by Egypt in its war against terrorism. 16:15 Army spokesman releases two aerial photographs showing militants' vehicles hit by the Egyptian air force in North Sinai. The militants are running away in the picture, he adds. 16:05 Italian foreign ministry condemns the terrorist attacks in Sinai and says Italy will continue to support the Egyptian government. "Egypt is a pillar of stability in the region and the escalation of the terrorist threat will not succeed in weakening the determination of its people and government," the statement read. 15:55 A senior official at Al-Azhar, Abbas Shoman, condemns today's violent terrorist acts in Sinai because they are "against the teachings of God and Islam." The main role of Al-Azhar, the most important Sunni Islamic institute in the world, is to spread correct Islamic knowledge and stress the sanctity of human life, he adds. 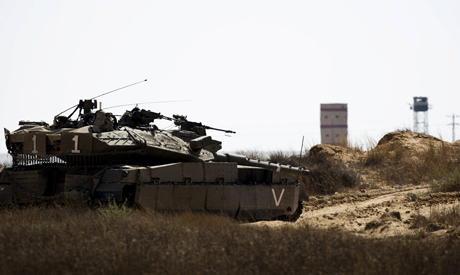 15:50 Two explosions are heard in the North Sinai city of Rafah, which borders the Gaza Strip, Reuters reports, citing security sources and witnesses. The cause of the blasts is not immediately clear. 15:45 Former liberal parliamentarian Amr Hamzawy, a government critic, states on Twitter: "God bless the martyrs of the homeland and Sinai. The taking of all blood is forbidden, every justification for terrorism is corrupt, and all celebrating over the dead bodies is morally shocking." 15:40 Tobias Ellwood, British Minister for North Africa, condemns the terrorist attacks in Sinai: "I condemn the deplorable terrorist attacks in North Sinai today that have resulted in the deaths of so many Egyptian soldiers. My thoughts are with the families of all those affected. The UK stands firm with the Egyptian people in their fight against the threat of terrorism." 15:40 Reinforcements from the Second Army Zone stationed in Ismailia have been deployed to Sheikh Zuweid, Al-Ahram's Hanaa El-Tabarany reports. Armed militants are roaming the streets of Sheikh Zuweid, eye witnesses say. Militants have reportedly killed several civilians who refused to allow them onto their rooftops to target security forces. Injured soldiers were transferred to hospital in armoured vehicles as ambulances could not enter the city due to IEDs placed on the highways, El-Tabarany added. 15:15 Egyptian F16 jet fighters have been spotted targeting militants in the city. 15:05 A number of Egyptian political groups condemn the Sinai militant attacks. Freedom Party leader Salah Hasballah says the terrorist insurgency in Sinai has taken a serious turn. Adding that Egyptians should not mourn, rather they should work to defeat terrorism. Salafist Nour Party leader Younes Makhioun says the criminal operations in Sinai will not break the determination of the Egyptian people. The Socialist Popular Alliance says today's attacks show terrorists are trying to destroy the Egyptian state, demands the criminals be brought to justice. Tagamuu Party says the attacks are shocking, especially because they are taking place during Ramadan. Islam does not accept such acts of violence, it adds. 14:50 Army spokesman Mohamed Samir says the two main terrorist bases have been destroyed and air force jets are bombing other sites. 14:45 The death toll continues to rise, but there are varying figures. A security source tells Al-Ahram that at least 60 soldiers and police have been killed or injured, while private media sources have quoted officials saying between 35 and 64. Hospitals in the Suez Canal cities of Ismailia and Port Said are on high alert to receive those injured in the attacks, a medical source says. 14:30 The IS-affiliated Sinai Province claims in a statement that it had besieged Shiekh Zuweid’s police station, destroyed two military tanks and attacked four checkpoints using mortar rounds. 14:00 Militants are trying to storm the besieged Sheikh Zuweid police station, according to several news websites. 13:55 Fifty Egyptain soldiers killed so far, security sources tell Reuters. 13:45 Israel closes Nitzana and Kerem Shalom border crossings amid ongoing clashes in North Sinai, Sky News Arabia reports. 13:35 Armed forces spokesperson Brigadier General Mohamed Samir says clashes with militants are ongoing. Seventeen militants have been killed so far. The death toll of soldiers and militants is expected to rise. This is the second official statement issued by the Egyptian armed forces about the on-going clashes in Sinai. 13:30: Security sources say the death toll of security personnel in Sheikh Zuweid is at least 20, with 30 injured. Health sources say Al-Arish Military Hospital has received the body of an army officer who was killed during the attack on El-Rafai checkpoint. He is reportedly Lieutenant Mohamed Ashraf Hussein. At least 20 Egyptian policemen and soldiers have been killed and 30 wounded in ongoing clashes with IS-affiliated militants in North Sinai on Wednesday, an official source said, marking the first major attack in the restive peninsula in five months. The security source, who preferred to remain anonymous until an official statement is issued, said 38 armed men have also been killed in the clashes that continue in the city of Sheikh Zuweid, according to Ahram's Arabic news website. Islamic State-affiliated Sinai Province, previously known as Ansar Beit Al-Maqdis, has claimed responsibility for the attacks in a statement. The IS group said that its allies had mounted 15 simultaneous attacks on military sites, including "martyrdom operations" on Al-Arish's officers club and two checkpoints in Sheikh Zuweid. Eleven checkpoints and a police station in Sheikh Zuweid were attacked by militants using missiles, the statement added. Al-Ahram's correspondent in North Sinai reported that a local woman and her 15-year-old daughter have been killed, and five people from a single family injured in the on-going clashes. Another security source said militants have occupied the rooftops of houses in Sheikh Zuweid after forcing the occupants to flee. Militants have planted IEDs on local highways to hinder the advance of Egyptian troops, he added. On Wednesday morning, around 70 militants fired mortar rounds and used a car bomb in separate attacks on five checkpoints in the town of Sheikh Zuweid, according to security sources. "Egyptian armed forces returned fire, killing at least 22 terrorists and destroying three vehicles armed with anti-craft missiles," army spokesman Brigadier-General Mohamed Samir said in a statement. There is currently a power cut in Sheikh Zuweid and local residents are staying in their houses due to the on-going fighting between militants and security forces, according to eye witnesses. This is the second major attack of its kind against security forces in North Sinai this year. In January, Ansar Beit Maqdis (aka Sinai Province) launched a series of attacks on checkpoints in Al-Arish and Sheikh Zuweid that killed 44 soldiers and police personnel. This is the third year in a row that a major militant attack has taken place in the Muslims' holy month of Ramadan. Ansar Beit Al-Maqdis declared allegiance to Islamic State in 2014. It was designated a terrorist organisation in Egypt in the same year. The group has claimed most of the attacks launched against Egyptian security forces over the past four years. The northern part of Egypt's border Sinai Peninsula has been a bastion of an Islamist insurgency that has spiked since the 2013 ouster of Islamist president Mohamed Morsi. Attacks have mainly targeted police and troops in deadly attacks that have killed hundreds, including civilians, over the past two years. On Tuesday, gunmen shot dead an Egyptian policeman outside a museum in southern Cairo and three suspected militants were killed in a car explosion in a suburb of the capital. On Monday, Egypt's top public prosecutor was assassinated in a terrorist attack when a car bomb struck his convoy in Cairo, the highest-ranking state official to be killed since Morsi's removal. Muslim brotherhoods farhan is going nuts clicking his fake votes. Give him a breather so he can build it up into the thousands. The fake vote counts are way under his quota to impress the feeble minded. The student is surpassing his teacher, ironic! Regardless of if it is MB affiliated or not, if you are pro-MB or not, if you like Sissi or not. This is not the actual problem. The actual problem here is that those conscripts are just like me and you, some might like Sissi some might not, but they are not the one who deserve to die. The Egyptian army is lead by a bunch jokes. The budgget is there and not a problem since buying high cost military planes etc seems to be no problem, however, like many military experts pointed out, there seem to be no preparation to face those kid of enemies from the Egyptian army and most importantly they did nothing new since the first attack. Neither are the conscripts well equipped or even well trained to deal with those kinds of situations. The average American soldier have 10 000$ of equipment on him to ultimately keep him safe. Can someone tell me how much an Egyptian soldier have on him ? 500$ is my guess, the cost of the automatic rifle and that's it. Really handy against RPG's and bomb cars. Arab killing other Arab will never stop.. The terrorists - all decendents of the MB want to destroy any and every government. The Egyptian people continue to suffer at the hands of the MB, strength and patients to Egypt. He is too embarrassed to post with his actual name. Enemies of Egypt, Islam and peace are raising their ugly heads to destabilize Egypt and create chaos by murdering high ranking officials and creating terror in North Sinai, which is adjacent to the Gaza enclave and Israel. While the border with Israel is safe and secure, the one with Gaza is always open to terrorist activities, because many of the tunnels are still operating and explosives and other armament is being smuggled to prolong terrorist activity in North Sinai.Egypt should take all possible political and military steps to quell the terrorists who are entering Egypt through secret tunnels to create disorder and crush them mercilessly and end their presence once for all. They destroyed Rafah Crossing and are coming to battle us. There targets are Sinai and Suez Canal. Wake up Egyptians. Egypt in danger under failed military leaders. Tahya Misr.